Tamang Hiratage treks give you rich architecture of their mountain houses, and the ancient monasteries and places of pray add color to the trial. 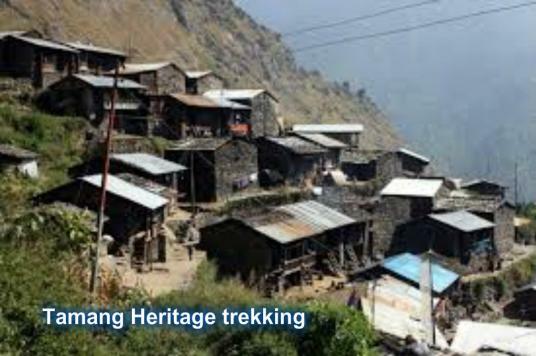 The trail of Tamang heritage is generally found in the Langatang region. This is a destination very near the Tibetan boarder recently made open for the practice of trekking. Broadly known by the name of Trekking of Bridim village, it provides the camping facilities and home stay. Destination yet less touristic, this trail is the illustration of an ancient lifestyle of the Tamang people who had migrated from Tibet to Nepal several centuries back. From the viewpoint of Nagthali Ghyang (3165m) see a panoramic view of Lantang, Kerung, and the Ganesh Himal, Sanjen Himal ranges. Beginning of day in Gatlang village,Tamang community offer us theirs traditional culture dance of women ,we will be participated cultural dance and songs of the region. Day 01: Join Kathmandu 1300m, Pick up airport and transfer to hotel. Day 02: Kathmandu valley sightseeing in UNESCO listed World Heritage Sites. Day 04: Syabrubesi - Gatlang/2238m. Walk approx. 5 hrs. Stay overnight in lodge. Day 05: Gatlang – Tatopani/2607m; Walk approx. 5-6 hrs. Stay overnight in lodge. Day 06: Tatopani – Nagthali – Thuman/2338m. Walk approx. 7-8 hrs. Stay overnight in lodge. Day 08: Timure – Bridim/ 2229m. 4-6 hours walk. Stay overnight in lodge. Day 09: Bridim – Syabrubesi/1450m, 4-6 hours walk. Stay overnight in lodge. Day 10: Drive back Kathamndu from Syabrubesi. Stay overnight in hotel. Day 11: Kathmandu Valley sightseeing or free day. Stay overnight in hotel.